Sometimes mods and add-ons seem to make the game. few weeks ago I traced inbound on Game and Player to searches for the FCOM Superpack. I reviewed FCOM: Convergence, a mod bundle for Elder Scrolls IV: Oblivion, in early 2008 and, thence, enjoyed daily visits from players of Bethesda's sandbox RPG who had become curious about a new way to experience the game. Steady traffic lasted for the better part of fifteen months then ebbed, before this latest spurt. 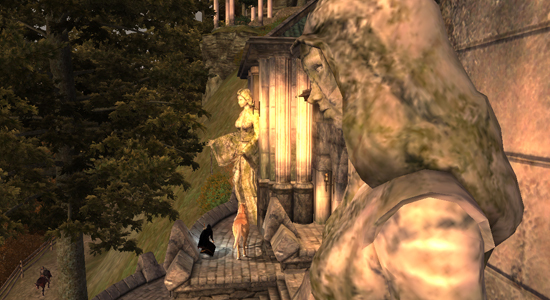 Having not played my PC installation of a thoroughly refitted Oblivion for at least a year, I took the opportunity to return to the websites of authors and users of code and media that embellish, correct and improve. These gamers are a devoted bunch — even today they suffer no shortage of interest to create or play, just as in months preceding Oblivion's 2006 launch, another community continued to labor at the four-year-old Morrowind. What struck me this time was not only how many more broad — or fastidious — changes have been made to original gameplay over even the last two years, but also how indispensable dozens of mods have become in order to strip the game of signature flaws and constraints that, by limiting replay, lethally date it. Oblivion's flaws have been removed so cleanly that I have no incentive to return to Bethesda's original version.Lakes and rivers suddenly teeming with fauna? Storehouses full of fresh weapons and armor? Intriguing, although certainly not necessary. Seasonal weather with dynamic thunder, following lazily when lightning is distant, with softly rounded storm sounds for characters who retreat indoors? An answer to my own picayune complaint; though again, something a player could live without. But impediments related directly to Oblivion's leveling system — princely brigands with enchanted swords, mechanics that marginalize entire classes and talent groups, treasure that merely fits expectations but never astonishes — have been removed so cleanly that, true to my declaration, a player such as I has no incentive to play Bethesda's original version. And if players were unable to experience Oblivion as now possible through amateur contributions, they might never return. Blizzard's World of Warcraft cannot be altered on a client level, but players have been configuring user interfaces for years — an evolution that, if undone, would revert the game to a state of unthinkable, and needless, difficulty. One add-on in particular, Deadly Boss Mods, is the sine qua non of those who brave dungeons in groups of five, 10 and 25. Emphasizing Blizzard's provided warnings of boss' special abilities and dangerous encounter events, it also adds alerts and timers that players demand — but which Blizzard doesn't explicitly provide. And the newest dungeon, Icecrown Citadel, involves such prolix choreography that even Deadly Boss Mods may not suffice. Blood Queen Lana'thel: can groups win the encounter without a certain add-on? Many believe they could not have.One Blood Queen Lana'thel, a vampire, bites player characters whose resulting strength and power allows them to defeat her. Ah, but blood-thirst must be sated — only one character is bitten first but every minute or so, he must bite another player within ten seconds or come under Lana'thel's thrall. Geometric progression results: two vampires, then four, eight, and sixteen in a 25-man group. As could be imagined, players contend with magic assaults that, at random, send them running from one end of the queen's chamber to the other, wreathed in colorful — and distracting — animations. No character may be bitten twice, so the prospect of building a lineage of renegade vampires without allowing one to die or become mind-controlled is daunting. Solution: somebody wrote an application that identifies bitten characters, assigns and announces targets in advance, and even marks targets to distinguish them from amid the kaleidoscope din. Can groups win the encounter without this add-on? Yes, and many have — but many more believe they could not have. My opinion remains the same: in spite of the gulf widened between their product and the yield of hindsight, a centripetal thing such as a software developer shouldn't be held to the expectations of hundreds of independent programmers and artists. Modders work additively, but also derivatively: they may introduce code but typically elaborate on a foundation already laid. They don't contend with deadlines, budgets, consumers or retailers. So we ought not be too disappointed when the wealth of a older game is set aside for a sequel; but it isn't untoward to think "plain" when we hear "new." This is all true. ES: Oblivion's upgrades made it so i can never go back. When i think of ES: Oblivion, i search for new mods just because i know it will only get better. As for WoW, its the little ones that really kill you when you see how much you need them. Casting cooldowns, Stun timers, Gear Score, Threat Meters, and Damage Meters... Blizz has been slowly adding them in as time goes on too (like threat meter on tooltips recently and Target of Target way way back when they downgraded Onyxia). They also have a really good tradition of recognizing the ones that don't take away the challenge and locking out the ones that give you the answer. One good example of Blizzard learning lessons, Timm, would be its version of Questhelper — almost all of the add-on's features without the processing overhead. Then there's EPEEN, a lighthearted response to the abuse of the otherwise practical Gearscore. As for Oblivion, I reached a point where I spent more time modding than playing!